School staff — administrators, aides, and teachers — have a hard job. So I have always made it clear to my children that if they are having problems with adults at school, they were going to have to tough it out. Of course, I was lying a little, but my kids did not need to know about the emails or conversations I would have with school staff from time-to-time. I wanted them to learn to obey the people in charge of them. That is, until last week. Last week, I told my kids to disobey. There is a long backstory here, save to say that over spring break I came to believe that staff at my kids’ holiday program were not allowing them to read during movie time. Movie time! 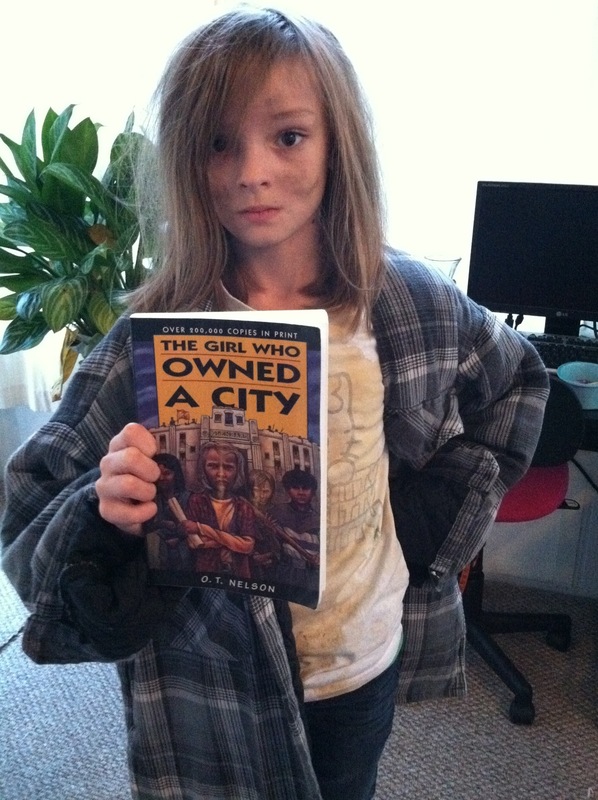 Kyla dressing up as one of her favorite book characters, Lisa, from a novel about a post-apocalyptic future in which all the adults are dead. If ever a rule needed disobeying, that was it. I remember the look on my kids faces when I told them to disobey. It was breakfast. My son stared at me in disbelief, and my daughter (the rebel) looked at me like Christmas had come early. (Seriously, she has never paid more attention to anything I have ever said.) They were not quite sure what to believe, so I repeated what I said, “If a [holiday program] teacher tells you not to read, you have my permission not to obey them.” It was a good lesson in civil disobedience. I will try to explain how the lesson unfolded over the course of the next several minutes as they finished breakfast and made their way to the district holiday site. “Civil disobedience only works when you get in trouble.” I told her about Martin Luther King Junior. Civil rights protestors flooded the jail cells. They made it logistically difficult for authorities to enforce segregation. Practically speaking, a law only works if it is enforceable. If enough people start disobeying a law, then the people in charge have to start making decisions about whether or not that law is worth the time and resources it takes to enforce it. “Civil disobedience draws attention to an issue.” That was the next thing I said. I told her about how Gandhi helped to liberate India from British rule by nonviolent resistance. He showed the world how cruel and violent the colonizers could be. People in his movement would not be allowed into a certain area. So he would organize them into rows. One row would advance and be beaten by the guards. They would be dragged off and tended to. Then the next row would advance and be beaten by the guards, and so on and so on. By being nonviolent, Gandhi did not give people much reason to support the British. In fact, he showed that their pretensions to being “civilized” were a farce. By this point in the conversation, my kids were in the car. My daughter began running through scenarios: “So if my teacher says [this], then I will say [that].” I stopped her and explained to her that she did not have my permission to get into arguments. She only had my permission to disobey. Honestly, I am still not sure if my kids were telling me the whole truth. It still seems unbelievable that staff at a school would order my kids not to read. But if my kids were not giving me the whole truth, well then I was calling their bluff. If they were being truthful, then the site director would have to explain to me that my kids got in trouble for trying to read during movie time. My guess is that that was a conversation she did not want to have. You should know that this issue had come up previously, and my response then was to send an email to the district coordinator. I received a reply formally stating that students were allowed to read during their rotations, and I shared that with my daughter. This was a couple of years ago. 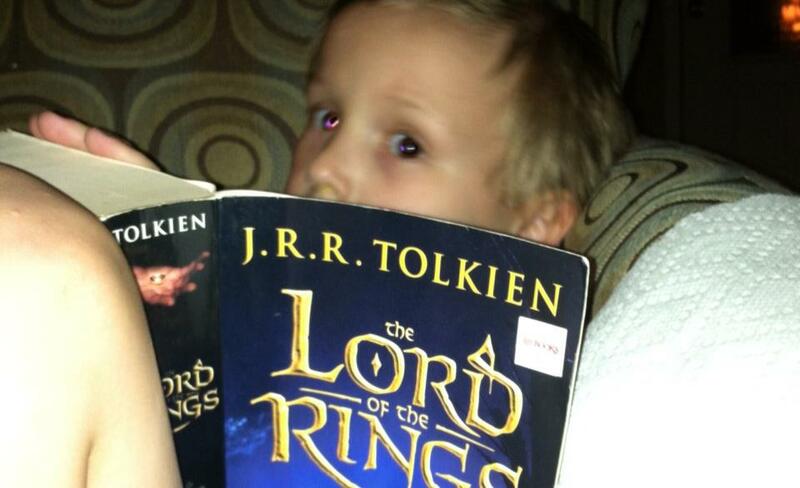 He read, like, a page. My guess was that the site staff were not following the policy because it was inconvenient. When you have a lot of kids, it is much easier to manage if everybody is doing the exact same thing. So I sent another email to the district director of the program. I explained what my children had told me, and I let her know that I had given them permission to disobey. Seriously, I was über-polite! She replied a couple of hours later. The previous district director had retired. The current director (the one replying to the email) was new to the job. She also loved books. She assured me that she would look into the matter. When I picked my kids up from the holiday site that afternoon, I asked my daughter if anything had happened. “Nope,” she said. She had read her book during movie time, and nobody said anything to her. The next day, my kids told me later, during announcement time the site director read aloud an email from her boss (the district director). From now on children were allowed to read during movie time. Period. I’ve been doing some reading and review of experiences with children and civil disobedience, when I came across your experience. I’m not sure I fully agree with your execution and I hope you don’t mind me leaving my observation. Parenting win? I’m not sure this really qualifies, as it sounds more like your own agenda being pushed through your children. I get it, you’d rather your kids read instead of watch a movie. Both are equally stimulating if attention is paid in earnest. As for the “Civil Disobedience” don’t you think this could have been handled better? Shouldn’t civil disobedience be used as a last resort? Do you really think MLK, Gandhi, and Jesus practiced civil disobedience as a first approach to their problems? No. If there is a more appropriate way to address the wrongness, that should be exhausted before one resorts to disobedience. Showing respect for the school system and its policies as a whole comes first. If there are better means for changing objectionable policies, those means should be exhausted before encouraging your kids to publicly disobey them, create a spectacle of themselves, draw unnecessary attention, and distracting an entire classroom. That’s the appropriate teachable moment you should have had with your kids. That’s the real parenting win. Well, my kids were the ones complaining to me. Also, I think you may be reading the wrong kinds of books if you think books can be as stimulating as children’s movies. Next Next post: What the Hell is Going on at NNU?